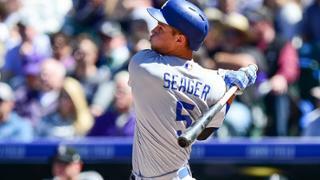 Corey Seager hit a two-run home run and Logan Forsythe went 3-5, leading the Dodgers to a 10-6 victory over the Rockies. Kenta Maeda pitched five innings and allowed four earned runs as he collected his first win of the season and the Dodgers avoided the sweep. Tyler Anderson pitched five innings in which he allowed five earned runs on five hits. The Dodgers jumped on Anderson early with a lead-off double by Logan Forsythe, then Corey Seager walked. Justin Turner drove in both runners with a double down the left field line. Seager added to the Dodgers’ lead with a two-run home run in the second. Forsythe was on first and Seager hit a first-pitch cutter over the center-field wall. The ball traveled 427 feet as projected by Statcast, the third longest of his short career, and left the bat at 104 mph with a launch angle of 26 degrees. Kenta Maeda pitched five innings in which he allowed four runs on five hits. Charlie Blackmon hit a two-run homer in the third inning off of a first-pitch curveball from Maeda. The ball went over the wall in right-center field, so it is hard to tell if the wind helped it or not. The Rockies added two runs in the fifth with a walk, a pair of singles and a sacrifice fly. The wind was not an issue for any of these at-bats. In the seventh inning, Seager led off with a single, then Turner advanced him to second with a walk. Then, on a passed ball by Tony Wolters, the runners advanced. The ball went into the dugout and Seager was told to stay at third. When a live ball is thrown out of play, the runners are given the next base, the question was what was Seager’s next base. If he touched third before the ball went into the dugout, his next base would be home plate, if the ball went into the dugout first, his next base would be third. The Dodgers challenged the play to see if Seager had, indeed, touched third before the ball rolled into the Dodgers’ dugout. The umpires ruled the call un-reviewable, and Seager stayed at third. Franklin Gutierrez then hit a groundball to third with the Rockies’ infield in, and Nolan Arenado threw Seager out at the plate. Justin Turner advanced to third and Gutierrez reached on the fielder’s choice by Arenado. On third, Turner was running up and down the line and drew the throw of Walters. The ball hit him in the back, and bounced behind Arenado, allowing Turner to score and Gutierrez advanced to second. The Rockies questioned the play for runner’s interference, but the umpires decided that there was no intentional interference. The Dodgers added two more runs in the frame on RBI singles by Adrián González and Joc Pederson. At the end of the inning, they led 9-4. Kenley Jansen entered the game in the ninth inning, even though it was not a save situation, but the last time he had pitched was on Wednesday against the Padres. He allowed two runs that were aided by the wild wind at Coors Field. DJ Lemahieu hit a triple that hit the scoreboard in right field, just over the glove of Yasiel Puig. Charlie Blackmon grounded out to first base but drove in Lemahieu and the score was 10-6. Gerardo Parra hit what looked like a flyout to center field for the third out, but the wind knock it down and Pederson was unable to catch it. Jansen then induced a pop out and the Dodgers won. The wind played a big factor in Sunday’s game. Balls hit to left field were not affected terribly by the wind, while balls hit to center field lost momentum and were even pushed backward by the wind. When the ball was hit to right field the wind would carry it and the fields usually had no chance of catching it. The Dodgers will open a three-game series against the defending World Series Champions, the Chicago Cubs. It will be the Cub’s home opener and before the game, they will have a banner raising ceremony to celebrate their World Series championship. Alex Wood will start for the Dodgers in place of Rich Hill, who is on the 10-day disabled list with blisters on his pitching hand. The Cubs will send Jon Lester to the mound. Lester is a left-handed pitcher, but he doesn’t throw to the base. If the Dodgers will actually steal bases instead of just taking lead-offs, they will be able to score off of Lester. The game starts at 5:05 pm PT and is televised exclusively on ESPN.